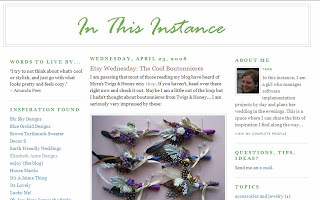 The lovely Tara of In This Instance blog has done a lovely feature on twigs & honey boutonnieres. Yay! She is like so many brides out there: working AND planning her fabulous wedding. During her day job, she "manages software implementation projects." Okay.. I think that would be enough for anyone to have to manage. Way to go Tara!! You make it seem so effortless. Visit her blog for some wonderful wedding ideas and follow her wedding planning journey!